God bless you brothers. When the Lord took my hand, I could see that I was standing on a rock, and behind us, I saw an angel. We began to go down through a tunnel with incredible speed. Quickly, I turned and saw that the angel was gone, and I felt so afraid. I asked the Lord, "Lord, where is the angel? Why is he not here anymore?" The Lord said, "He cannot go where we are about to go." We left there and soon arrived at a place we called, "The Valley of the cauldrons". These cauldrons were full of a boiling mud, and we got close to one of them. The first person that I saw was a woman. Her body floated and sank with the boiling mud, but when the Lord looked at her, she stopped moving and remained suspended in the mud at waist-level. The Lord asked, "Woman what is your name?" She answered, "My name is Rubiella." She shouted, "Lord, please! Take me out of this place. Have mercy on me! I can not continue like this any longer! Make it stop Lord! I can not stand it any more! Please have mercy on me!" The Lord asked her why she was there. She said she was there because of vanity, which was the same word written on the metal plate on her chest. In her hand was a normal looking bottle, but to her it appeared to be a very expensive perfume. Rubiella had to take the bottle, which was full of acid, and spray it all over her body. 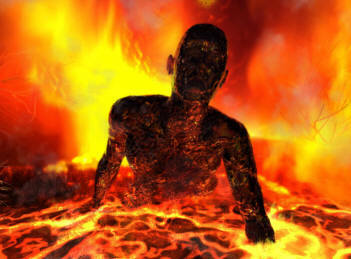 This caused, all the flesh that was sprayed to melt, causing her great pain. She shouted to the Lord, "Lord please, have mercy on me! I can not be here any longer! Just a single second Lord." I am not saying that it is a sin to use a perfume, but the Lord told us that the woman was there because of her perfume, as the Word of the Lord tells us in Deuteronomy 5:7 "You shall not have other gods before me." She was there because her beauty, perfumes, and vanity were first place in her life. However, the Lord Jesus is King of kings and Lord of lords! He has to be the first in your life; that is why she was there. With sadness, the Lord looked at her and said, "Rubiella, it is too late for you, worms shall be your bed, and worms shall cover you." When the Lord said that, a blanket of fire totally covered her. 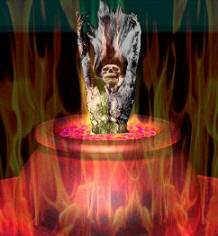 While her body was being consumed inside that cauldron, she suffered horrible pain. The Lord looked at us and said: "Look, these are the wages for the dancers." They had to jump wildly up and down to the beat of the music. If salsa was playing, they had to jump to that beat, if any other kind of music was playing, they had to jump to that beat. They could never stop jumping. But worse than that, their shoes had 6 inch spikes on the bottom. Whenever they jumped it would pierce their feet, and they never had a moment's rest. When someone would try to stop, demons would come at once and stab them with spears, cursed them, and saying, "Praise him! This is your kingdom now, Praise Satan! Praise him! You can't stop, praise him! Praise him! You have to praise him! You have to jump! You have to dance! You can not stop one single second." It was terrible that many of the people were Christians who knew the Lord, but they were in night clubs when they died. Maybe you are asking, "Where does it say in the Bible that it is wrong to dance?" In James 4:4, the Word of God says: "Do you not realize, you adulteresses, that friendship with the world is enmity toward God? Therefore, whoever determines to be a friend of the world becomes God's enemy." Also, in 1 John 2:15-17, "Neither love the world nor the things in the world. Whoever loves the world has not the Father's love in his heart, because everything in the world, the passions of the flesh, the desires of the eyes, and the proud display of life have their origin not from the Father but from the world. And the world with its lust passes away, but he who does the will of God remains for ever." Remember the world will pass away, all this will perish, but the one who does the will of God stands forever. My friends and brothers, when we left this place, we saw something like bridges that divided hell into different sections of torment. We saw a spirit walking over a footbridge. It looked just like a doll that we have seen on the Earth; we call them Treasure Trolls. They have different color hair, with an old man's face but a kid's body; without sexual parts. Their eyes are full of evil. The Lord explained that these were spirits of loss. This spirit had a spear in his hands and was walking pompously on that footbridge, like he was royalty. As he walked, he stabbed people down below his spear. He would curse them saying, "Remember the day you were outside of a Christian church and you did not want to come inside? Remember the day they preached to you and you did not want to listen? Remember the day they gave you a gospel tract and you threw it away?" The lost souls would try to cover the area where their ears used to be. They would reply to the demon, "Shut up! Shut up! Don't tell me anymore! I don't want to know more, shut up!" However, the evil spirit enjoyed doing that because of the pain it inflicted on the souls. We continued walking with the Lord. Upon looking at a mass of people, we noticed one man was shouting louder than the others who were burning there. He was saying, "Father, Father, have mercy on me!" The Lord was not going to stop to look at this man, but when He heard the words "Father" He shook and turned around. Jesus looked at him and told him, "Father? You call me Father? No, I am not your Father and neither are you my son. If you were my son, you would now be with me in the Kingdom of Heaven. You are sons of your father the devil." Immediately a blanket of fire came up and totally covered his body. The Lord told us the story of this man's life. The man called Him Father because he had known Him. He used to go to church and listen to God through His Word, and he had received many promises of God. So we asked, "What happened Lord? Why is he here then?" The Lord replied, "He was living a double life; he lived one way at home, and another at church. He thought in his heart, 'Well, there is no one that lives close to me, not the pastor or any other brother, so I can do whatever I want'. But he forgot that the eyes of the Lord are set on all our ways and that no one can lie or hide from the Lord." The Word of the Lord tells us, "Don't lie to your selves God can not be deceived. Because everything a man sows, the same he will harvest." (Galatians 6:7) This man was suffering a thousand times worse than others. He was paying a double condemnation: one for his sins, and one for thinking he could deceive the Lord. Today, people try to rank the gravity of sins; they think that homosexuals, thieves, and murderers are greater sinners than liars or gossips. But in the eyes of the Lord, all these sins have the same weight and the same pay. The Bible tells us, "The wages of sin is death" "the soul that sins will die." (Romans 6:23) (Ezekiel 18:20) My friends and brothers, I invite you now to accept Jesus' invitation. Jesus is extending His hand of mercy to you if you repent. The Word of the Lord tells us that the one that changes his ways and repents will be given mercy. It is much better to believe now, than to wait and find out the hard way later. God bless you.